Don’t Need A Mobile Solution? Think Again! Although it is probably obvious, I would like to first assure you that this post has been written by a real person. But these days according to this article in the New York times I shared earlier this week - you can’t be so sure. From now on it may be a good idea to clarify this up front so that people know if they are reading something written by an algorithm (software program) or a real person. Otherwise you may be wandering from now on who or what actually wrote the article. If you are one of the many companies that do not have a mobile solution or maybe even think that you don’t need one-Think again! As the technological capabilities of mobile devices continue to increase and mobile’s share of total web traffic skyrockets seriously considering creating a mobile version of your website is already past due and most likely costing you money. For no other reason if you haven’t heard that Google has laid to rest any speculation over their intentions concerning mobile search. On February 26th Google announced "Starting April 21, we will be expanding our use of mobile-friendliness as a ranking signal. This change will affect mobile searches in all languages worldwide and will have a significant impact in our search results." Google isn’t going to be penalizing websites that fail to be mobile-friendly but if you have mobile friendly website you will benefit from a lift in ranking over the ones who do not. If you already have a mobile solution and want to check its mobile friendliness through Google’s eyes they offer a site where you can find out here with their Mobile-Friendly Test. If you don’t have a mobile solution or a mobile friendly site and this hasn’t raised an eyebrow read on. We all know that mobile is playing an increasingly important role in online marketing today just ask the 90% of people who say that mobile devices are a central part of everyday life. There is no part of most of our lives today that is not touched in some way by mobile. Almost half of all mobile phone users in the United States use their mobile devices to perform product research, including local searches and some sources report that now 80% of local searches on mobile searches phones end in a purchase. Globally 40% of the world’s population is online. Close to one in three people in developing countries are online and by simple economics many people in developing countries are and will be using a mobile smart phone as an all in one device for their telephone and internet for the utility it offers. Many people in developing countries do not have the luxury of being able to afford a variety of devices. B2C marketers are generally the early adopters of new technology that B2B eventually adopts. Not to mention that to keep your website fully optimized in Google’s eyes, which should be reason enough, there is just no denying the mountain of data out there that should be convincing on its own. Also, if potential clients see that you have no mobile solution they might assume that your business is not up with times and using the latest technologies and possibly move on to look for one that is. Social media and the global web provided B2B marketers with new ways to penetrate markets that might not otherwise be as effective, efficient or available like location based services (LBS), and using other channels. This means that mobile can open up new avenues to engage with prospects wherever they may be to grow new markets that can drive more revenue to B2B businesses that generally are not restricted to specific regions. According to the IDG Global Mobile Survey, For senior executives, smartphones are a critical business tool. The majority of senior executives (92%) own a smartphone used for business and 77% percent of executives use their mobile device to research a product or service for their business. Due to the mobility of professionals today they need to access information, email and to communicate with their office and clients from wherever they happen to be and whenever it is convenient to do so. Mobile devices provide the means to do this. If you remember one thing and that is Mobile is here to stay and is growing exponentially. Just between August 2013 and August 2014, mobile web usage grew by 67 percent. So if you don’t “Go Mobile” you will undoubtedly soon be on the outside looking in. Which Mobile Solution is Best? Once you decide to go with a mobile solution possibly the biggest decision you'll make is deciding on the mobile solution that is best for you. Google supports: responsive, adaptive (dynamic serving) or a separate mobile website solution (separate URLs). Each has its advantages and disadvantages. Google prefers responsive design but supports all three options as long as long as you have them optimized properly. Responsive web design: Serves the same HTML code on the same URL regardless of the users’ device (desktop, tablet, mobile, non-visual browser), but can render the display differently (i.e., “respond”) based on the screen size. Responsive design is Google’s recommended design pattern. Dynamic serving: Uses the same URL regardless of device, but generates a different version of HTML for different device types based on what the server knows about the user’s browser. Separate URLs: Serves different code to each device, and on separate URLs. This configuration tries to detect the users’ device, then redirects to the appropriate page using HTTP redirects] along with the Vary HTTP header. There are varying opinions on which one performs best and then there are hybrids so choosing which one is best for you can be difficult. And as with anything they all have their advantages and drawbacks. There are varying opinions depending on who you talk to so it is best to seek the advice of professionals (plural) who can advise you on the best solution for you based on your type of business, costs and what exactly what your individual goals may be. 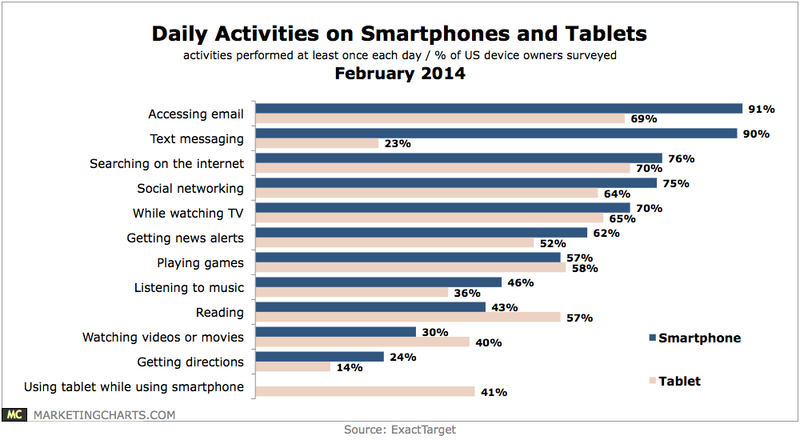 Yet another factor to consider when we think about mobile is email. According to some key findings in a report by Movable Ink 66% of emails were opened on a smartphone or tablet-Smartphone 47.22%, Desktop 34.26%, and Tablet 18.51%. If your emails are not optimized for mobile it will make it difficult for recipients to take action and it will most likely have negative consequences on your email campaigns. All combined, you can see how important having a mobile solution is for your business and the consequences that not having one can bring which includes the negative effects it can have on all of your marketing campaigns. 2. Some visual content with this infographic published in a news release at PR Newswire by SCORE a resource partner with the Small Business Administration that provides free business mentoring services to entrepreneurs in the United States. .
How people access their e-mails today is yet another reason that shows us the importance of having a mobile friendly website. It is no longer an option but something you need to implement. With the amount of people accessing the internet on mobile devices the risk of losing out to competitors is becoming more and more apparent and the cost of not being mobile optimized greater than cost to implement. Ensuring scalable content can be delivered to mobile devices is an important and now low cost part of any business or enterprise as more and more people demand such experiences across virtually all industries. All your devices are important – that’s why it is a must that your interfaces are as easy to master as possible from a common dash board. The number of ecoupons redeemed by consumers is expected to double over the next three years, driven in large part by mobile, which is impacting how consumers search for, store and redeem offers, according to new research from Juniper Research. Consumer behavior is evolving to incorporate online or mobile coupon search, resulting in a sharp rise in traffic to coupon sites and an increase in coupons being stored on mobile devices, per the report. However, food brands have, for the most part, failed to capitalize on the opportunity in digital coupons, according to separate research from L2. Mobile coupons have been gaining steam for a several years but now seem poised to really take off thanks to the growing adoption of mobile and the way that consumers are increasingly integrating mobile into their everyday lives. The number of ecoupons redeemed will top 31 billion in 2017, up from 16 billion this year, per Juniper Research. Additionally, the merchants and third-party app developers involved with mobile coupons continue to make more coupons available on mobile while also fine-tuning how the coupons are delivered, stored and redeemed to make the process as seamless as possible. However, many brands continue to lag behind when it comes to addressing the opportunity in digital coupons. According to a recent report from L2, the majority of food brands have not realigned their coupon programs to meet the quickly shifting online and mobile needs of their customers. For example, while nearly 61 percent of the brands reviewed by L2 offered coupons on Amazon, only one out of three offered coupons on Walmart or Target. Even less distribute digital coupons on Peapod or FreshDirect and 25 percent of brands do not distribute digital coupons at all. A growing number of retailers, such as CVS and Walgreens, offer the ability for loyalty members to download coupons onto a loyalty card, but only 18 percent of brands push coupons to the CVS site and only 9 percent to the Walgreens site, per L2. The food brands with the highest number of commerce partners for coupon distribution include Hormel, M&Ms and Dole. Juniper predicts that while there will be some growth in print-at-home digital coupons, the increase in redemptions for digital coupons will be primarily driven through in-store, bar code-based redemptions and online redemptions. Supporting the forecasted growth in digital coupon redemptions is an evolution in consumer behavior, with shoppers increasingly incorporating online or mobile coupon search prior to either remote or in-store purchases. As a result, there has been a sharp rise in visits to the couponing section of retailer sites as well as to aggregator sites. Consumers are also increasingly storing coupons on their mobile devices in a wallet such as Passbook, Samsung Wallet or Google Wallet and redeeming them at a later date. One potential development that could boost digital coupons is if couponing platforms are integrated with leading social media platforms, providing an opportunity for targeted offers, per Juniper Research. However, digital coupons face some hurdles, including a lack of scanning infrastructure at retailer point-of-sale. The opportunities in mobile couponing are not going unnoticed. The RetailMeNot coupon application this week unveiled an updated and redesigned app, with a more personalized savings experience on deals that are relevant to a user’s retailer or brand preferences. On the app’s home page, users can now access the top offers for their favorite stores, see what other offers are trending among the app’s users and find the best new deals of the day. Other couponing apps continue to grow while new ones continue to hit the market. One of the newest is BluePromoCode for iPhone, which provides a daily feed of coupons from users’ favorite stores. The app enables users to claim coupon codes, shop sales and download in-store coupons. “Retailers and brands are in the early innings of this ball game when it comes to taking advantage of the mobile opportunity to drive traffic, brand awareness and sales through mobile marketing channels like the RetailMeNot app,” RetailMeNot’s Mr. Hoyt said. “There is a bigger opportunity than just serving retailers' e-commerce channels. “Mobile offers also are making the in-store environment a more vibrant, relevant experience for consumers,” he said. “What was once a test and explore mentality with a small group of retailers wading into mobile offers is becoming an increasingly sophisticated omni-channel tactic within a retailer’s marketing toolkit to use services like RetailMeNot to drive sales. While responsive design can be a great tool for retailers and ecommerce brands looking to reach mobile users, more marketers are finding out the hard way that it can actually hurt Web site performance and sales. The reason: Cramming all the content from a full Web site into a small screen can slow down site speed and degrade the customer experience. That is a serious problem in a world where more consumers are powering up their mobile devices to connect with the brands that are important to them. Too often, responsive design backfires by causing slower rendering and page load times. So while marketers think it will lead to better mobile engagement, they are surprised when their site analytics show a decline in key metrics such as time to render, time on site and conversion rates. According to an estimate by the Aberdeen Group, a one-second delay in page load time can reduce conversions by 7 percent. So for mobile consumers on 3G or 4G networks, heavy content and rich media can slow load time to the point where they abandon a page in frustration. It turns out that responsive design is not the magic bullet for mobile Web sites. But with a little more planning, marketers can ensure it improves the customer experience as originally intended. A study by Nielsen showed that United States adults spend more time on the Internet using mobile devices than desktops, and 87 percent of smartphone and tablet owners use their devices for shopping. As more consumers turn to smartphones for ecommerce, retailers must change their mindsets and start designing pages for small screens first and then tailor their sites for desktop. Here are four tips to help retailers improve responsive design performance and enhance the mobile experience for consumers. 1. Get outside and test the real thing: One thing that catches many of our customers off guard is the experience of actually using their site like a mobile consumer. Synthetic and real-user monitoring can be helpful for testing, but nothing compares to seeing the real thing. Everyone involved in your Web site – from the business team to the engineers to quality assurance – should be encouraged to access your site at lunch, in the elevator and while they are traveling between cell towers. In other words, get outside and off of your high-speed Wi-Fi connection. The insight into where the gaps occur in the user experience is invaluable to making and prioritizing the right decisions for your Web site project. 2. Put mobile first: Many solutions exist for adjusting page layouts or grids for the user’s screen size, but a collapsing grid can become a conversion killer if not done correctly. If you are still trying to scale your desktop site down for mobile devices, you are likely to damage the page layout and inadvertently alter the buyer’s journey on a given page – a critical call to action may be buried below the fold, fixed-width ads may challenge the collapsed layout, and rich media and third-party content may overpower the rest of the page. With that in mind, it is crucial to design your grid for mobile first to ensure that information is organized for small screens. Scaling up is simpler, too. 3. Incorporate dynamic serving: Dynamic serving is a critical aspect of responsive design that changes the HTML code of a site based on user device and other factors. This creates a customized user experience because retailers can resize, compress and sequence images for each site visitor. Dynamic service creates rules defining how content is delivered based on factors such as location, device and connection speed – meaning the online shopping experience is optimized for each individual visitor. So while desktop and tablet users might get served rich media, mobile users experience a much leaner site that loads faster because it is not slowed down by complex content and media. 4. Prioritize your content: Sequencing your application’s content allows brands to deliver important page elements such as product details first and serve rich media information at a later time, depending on the user’s time on site and on-page interactions. This helps site owners improve site speed and conversion rates on responsive design Web pages by waiting to load large site features and content until the user is ready to access them. Also, this just-in-time content approach ensures that visitors do not have to wait to see a page getting bogged down by elements such as social media widgets and videos. WHILE IMPLEMENTING responsive design might result in a functional, good-looking mobile Web site, marketers have to consider more than just aesthetics. By also focusing on user engagement, brands will ensure that responsive design actually meets the goal of improving the mobile experience. Ari Weil is vice president of products at Yottaa, a Boston-based cloud-based acceleration platform. Reach him at aweil@yottaa.com. Talk about a growth market. A new survey by eMarketer indicates that smartphones are where the action is: by the end of 2014, 1.76 billion people are expected to own and use smartphones monthly. That’s growth of more than 25 percent over 2013. And that is one global Godzilla. The data indicates that by 2017, more than one-third of all people around the globe will be smartphone users. 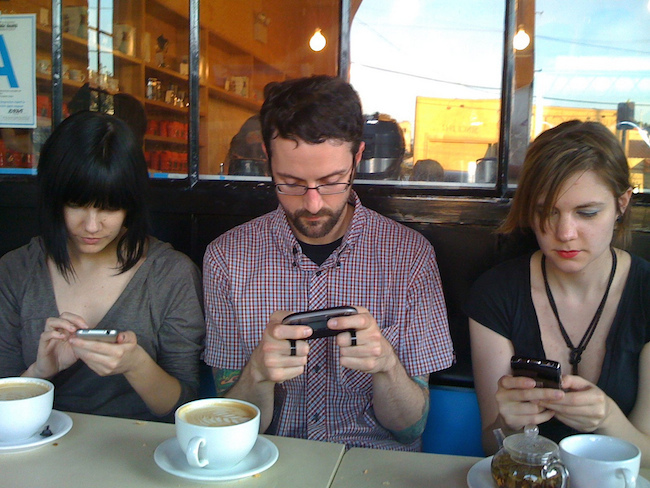 eMarketer’s estimates for smartphone users tally the number of individuals who own and use smartphones (not the number of smartphones each of those individuals might have). In fact, smartphone usage has already saturated more than half of the population in many countries—or will in the next few years. Consumers in Asia-Pacific will account for more than half of all smartphone users this year, eMarketer estimates, totaling 951.0 million. South Korea is the world leader in terms of smartphone penetration, where smartphones were in the hands of more than half the citizens by 2012. Australia followed closely behind, becoming the only other country in Asia-Pacific to have more than half its population using smartphones in 2013. Japan is expected to reach the 50 percent tipping point in 2014. Though China will not reach majority-smartphone status until 2018, its smartphone user base is already the largest in the world by far—totaling 521.7 million this year. Western Europe—the region with the second-largest number of smartphone users, with 196.6 million in 2014, eMarketer estimates—saw three Nordic countries reach 50 percent penetration last year, and this year, the Netherlands and UK will join them. 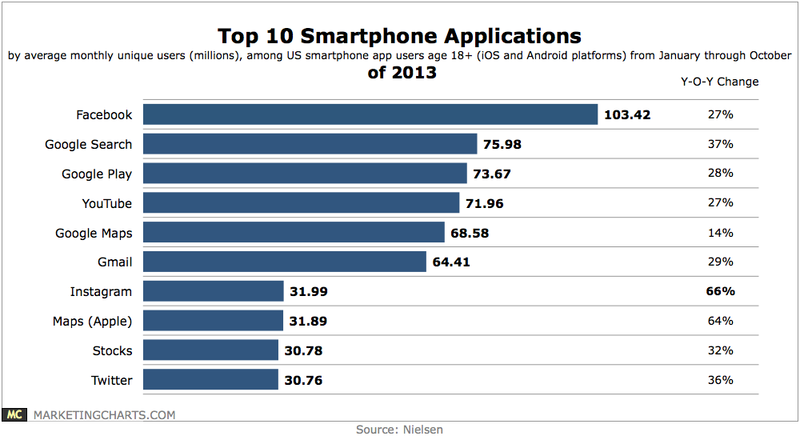 In 2015, a raft of other countries, including the rest of the EU-5, will make the majority smartphone jump. Like the UK, the US will also reach majority-smartphone penetration among its population this year, a major milestone for two of the most advanced internet markets in the world. The US remains the second-largest smartphone market worldwide, behind China, totaling 163.9 million users in 2014, eMarketer estimates. The US will retain that status until 2016, when India is projected to nab the second place spot. Canada will be soon to follow, with smartphone users surpassing 50 percent of the population in 2015. While much of the talk around geofencing has focused on driving foot traffic with an ad delivered to a nearby customer, a growing number of retailers are recognizing opportunities with geofencing after stores close or when a location has shut its doors for good. The trend points to the growing sophistication of mobile marketing, with brands increasingly looking beyond simple location to take into account other factors that can drive more contextually relevant experiences for consumers. For example, by geofencing stores that have recently shut down, retailer Ashley Stewart hopes to retain customers by driving them to another nearby outlet or to its mobile site. “Geofencing - or location based targeting - can be an effective tool when stores close,” said Pehr Luedtke, CEO of Spotzot, San Francisco. “Retailers can geofence an area around the closed store and alert consumers to nearby locations, and even provide special deals to those consumers if they go to another store. “It's a way to maintain loyalty,” he said. Ashley Stewart recently announced a Chap. 11 bankruptcy restructuring plan that includes the immediate closure of 27 stores and a likely sale of the company. The chain has 168 locations across 24 states. Holding onto existing customers is critical for the retailer during this period of upheaval, with location-based targeting on mobile one way it is looking to retain them. The retailer is currently working with Spotzot on a campaign that will launch in the next few weeks in response to the fact that some stores have been closed. For the campaign, Ashley Stewart will put a geofence around the closed stores and leverage Spotzot to deliver coupons to nearby customers and direct them to the closest open Ashley Stewart outlet or online to its Web site. “We want to geofence customers who shop at those stores and use Spotzot to get customers to shop at the nearest location or to transfer onto the Web so that we don’t lose that customer,” said Larry Gray, CRM director at Ashley Stewart, Secaucus, NJ. “That is a very big project for us,” he said. “It is very important to us. Ashley Stewart is also considering delivering coupons to customers nearby competitors’ stores in a strategy known as geoconquesting. Ashley Stewart has been ramping up a coupon-driven mobile advertising program over the past six months with a several different providers. Mobile couponing is becoming increasingly important for the retailer as direct mail prices continue to increase. “It is a very important strategy,” Mr. Gray said. “It is a regular part of our couponing. “We are reducing our direct mail with the postage rate increases, we are reducing that end of it and really pushing on this end of it,” he said. 1800Flowers is also trying to use geo-targeting in more contextually relevant ways. When a recent geotargeted campaign delivered to users within a mile of 100 franchise retail locations revealed significant click-through rates between midnight and 4 a.m., when stores were closed, the ads were tweaked to include a click-to-call button and a buy online button. The results proved to 1800Flowers that geotargeted ads are not only effective when retail stores are open. The retailer also gained a competitive advantage since other brands were not likely tailoring their efforts towards consumers who were out and about that late at night. The lesson from these examples is that using geofencing to deliver ads should not simply about a location but needs to also take into account a user’s context. However, geotargeting during off hours is likely to be more limited simply because there will be less traffic near a store during these hours. “A great use case would be for a closed store to send a message to the customer saying the store was closed, but “you can browse our inventory/order from us at our website” and/or point them to a different location,” said Janna Badalian, marketing director at MobileSmith, Raleigh, NC. “This keeps customers from having to walk up to a door only to find the store is closed, as well as provides an alternative to drive sales. Associate Editor Chantal Tode covers advertising, messaging, legal/privacy and database/CRM. Reach her at chantal@mobilemarketer.com. Delivering marketing messages and content on mobile platforms has become essential as part of any digital marketing solution. You need to have a mobile solution that responds to all device screen sizes for optimal viewing. Some websites are recording 30-40% of all traffic from mobile devices. Responsive design is what is trending today for website mobile solutions because of its ability to adapt to any screen but adaptive design does have its place depending on the experience you are looking provide. Whatever your preference or need may be, having a mobile solution today is essential if you want to successfully compete in today’s digital marketplace. Find out what is going to work best for you by knowing the differences so you can make the right decision in choosing your mobile solution. One thing is certain. If you are not reaching the mobile user you are losing a lot of traffic to your website. More than 50% of the pages for local search visits are made on mobile phones and local search is projected to surpass desktops by 2015. And according an exact target 2014 mobile behavior report 76% of smartphone users and 70 % of tablet users search for something on the internet at least once a day. There are other considerations that must be included as part of your mobile solution such as having an easy way to find or contact your location, easy navigation, search and reviews. Your mobile should be integrated with and serve as an extension of a well constructed online website to engage this rapidly growing and important segment to increase your visibility and increase sales. Some 52% of “social sharing actions” – sharing of website content such as articles, photos and videos via social networks – occurred on a mobile device during the first quarter of this year, reveals this in a new report. Mobile took the lead on the back of a quarter-over-quarter growth rate in sharing that was more than twice as high as desktop’s (28% vs. 11%). While the iPhone (25%) remained the top mobile device used for sharing, Android smartphones (17%) narrowed the gap. This had previously indicated that social sharing behavior was more prevalent on mobiles than on desktops, but this is the first release to state that mobile has overtaken desktop in sharing volume. The new data comes after a recent report from comScore [download page] showed a “multi-platform” shift last year. Looking at the distribution of digital media consumption, comScore demonstrated that multi-platform users (those who use both mobile and desktop devices) grew from 48% share of the digital audience in February 2013 to a majority 56% share in December. With another 8% in December counting as mobile-only, that left just 36% of digital media consumers visiting from desktops only. After rapid growth last year, sharing to Pinterest increased by only 5% in Q1. Email continued to decline as a social sharing channel (-25%), while content sharing growth was higher for Hispanics than for blacks and whites across Twitter, Reddit and Pinterest. About the Data: The analysis is based on sharing behavior across more than 120 social channels using ShareThis tools enabled on websites reaching 95% of the US online population on desktop and mobile devices. Given that the data pertains to use of ShareThis tools, the results do not account for copying and pasting of links. We all know that mobile is playing an increasingly important role in online marketing today just ask the 85% of people who say that mobile devices are a central part of everyday life and further illustrated below by this demographic smartphone ownership survey published by Pew Research January 2014. Furthermore, according to web and mobile measurement firm comScore 55% of all time spent with online retail as of June 2013 occurred on a mobile device, 45% occurred on desktops and laptops. Specifically, smartphones accounted for 44% of retail Internet minutes while tablets accounted for 11%. We can all agree on the importance of mobile today but we also know to keep in mind that statistics can be misleading depending on who is using them and what they are trying to accomplish. This article seeks to address all the talk recently on the popularity of mobile applications and put it in perspective and to address an apparent content deficiency on many mobile platforms which today is one of the most important media forms for driving customer engagement. First, the fact is in a lot of cases having a mobile app for most businesses is not going to provide much if any marketing benefit in reaching consumers. So before you make an investment in building your own mobile app make sure you know what the statistics are really saying and if it is right for you to act on, and if building your own app is going to provide you with any real or long term benefit. Is a mobile app a substitute for a mobile Website/mobile-optimized Website? According to Canalys., the total number of apps through the Apple App Store and Google Play, just two of the largest, offer over 1.6 million mobile apps. So unless you build an app that is going to take the market by storm or is needed in order for your company to operate- what do you think the chances are that you app will even be found? If you build a specialty app that is available to download from your site consumers first need to find your site to download it. After you know and understand mobile apps and which ones that are dominating mobile and by first having in place the tools to provide good organic search rankings and social media initiatives you should conclude that by being involved through having a fully integrated mobile solution for your website is probably your best plan of attack and should be your first priority. “Through their mobile website” In my opinion is confusing and should read “Through their mobile soloution.” Because today’s platform technology makes it possible to integrate mobile as an extension of a website platform negating the need for a separate website for mobile that enables any or all of the content on your website accessible from mobile. But as pointed out in this graph 67% of respondents surveyed stated that mobile-optimized websites are more user-friendly but are not meeting demands in terms of accessible content- a problem to which as I have stated above are viable solutions. By being properly informed the right decisions can be made that can avoid costly mistakes and provide the information on which to make sound investment decisions. And there are technological solutions to addressing the issues and concerns addressed here that will best serve your needs to provide the best ROI possible. So work with someone who is just not looking for a sale, will give you the broad picture and who will work with you to find the best overall solutions for you. Do you need a Mobile Solution? You need to have a mobile solution that responds to all device screen sizes for optimal viewing. Some websites are recording 30-40% of all traffic from mobile devices. This should not be ignored. If you are not reaching the mobile user you are losing a lot of traffic to your website. More than 50% of the pages for local search visits are made on mobile phones and local search is projected to surpass desktops by 2015 and increases outside the U.S. and England because a higher percentage of people who use mobile phones as their primary or only device to go online. There are 6.8 billion mobile subscriptions worldwide, estimates The International Telecommunication Union (February 2013). That is equivalent to 96 percent of the world population (7.1 billion according to the ITU). And is a huge increase from 6.0 billion mobile subscribers in 2011 and 5.4 billion in 2010. Mobile subscribers in the developed world is rapidly reaching saturation point with at least one mobile subscription per person. Mobile penetration in developed nations is around 128 percent of the population. This means market growth is being driven by demand developing world, led by rapid mobile adoption in China and India, the world's most populous nations. Mobile penetration in developing nations is around 89 percent of the population, according to the ITU. At the end of 2012 there were 5.2 billion mobile subscriptions in the developing world (76.6 percent of global subscriptions). Mobile penetration in the developing world now is 89 percent, with Africa being the lowest region worldwide at 63 percent. 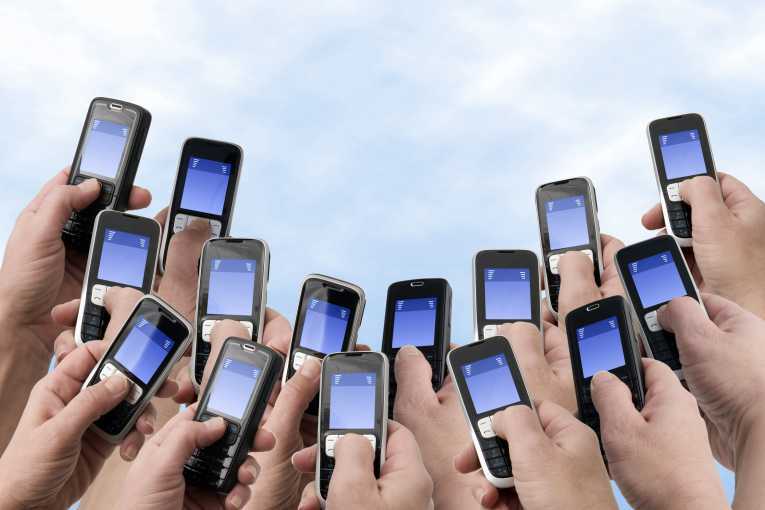 Portio Research – in the excellent free Mobile Factbook 2013 predicts that mobile subscribers worldwide will reach 7.0 billion by the end of 2013, 7.5 billion by the end of 2014 and 8.5 billion by the end of 2016. Over half of the world’s mobile subscribers are in Asia Pacific. Portio estimates that Asia Pacific’s share of the mobile subscribers will rise from 51.3 percent in 2012, to 52.3 percent in 2013 and 54.3 percent in 2016. By 2016 Africa and Middle East will overtake Europe as the second largest region for mobile subscribers.